Categories: Aqua / Turquoise, Blue. Ah, the serenity of the waves gently lapping against the shore whilst you and your guests sip champagne on a perfectly manicured lawn overlooking the sea after marrying your true soulmate – what could be more perfect? The Ocean Wave invitation perfectly conjures up all that’s great about seaside weddings, whether you’re planning on getting hitched in a hotel overlooking the sea, laughing with your guests in a lighthouse or saying ‘I do’ in an Indian tent on the beach, the simple and elegant design of this little beauty will not only suit a wide range of wedding celebrations, but eloquently get your guests in the party mood too! 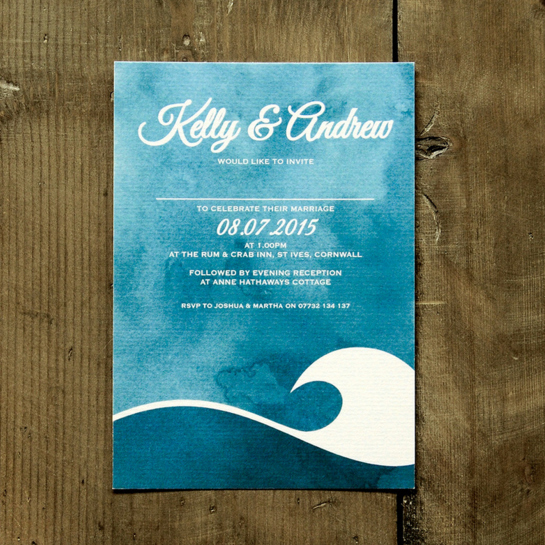 Professionally printed onto 148 x 105mm (A6) deluxe ‘feel good’ textured 320gsm stock, the Ocean Wave design from Feel Good Wedding Invites feels just as amazing as it looks and will perfectly echo the sophistication and elegance of your wedding celebrations. The watercolour style of this outstanding design gives a real bespoke and hand crafted feel, whilst all of the wording is totally customisable, leaving you to invite your guests in your very own personal style. Need to say a bit more? This design is one sided, meaning that you are free to place as much detail as you like on the back; why not include a handy map of how to get to the ceremony and reception, dress code or wedding present instructions, or even a little story of your whirlwind engagement? Available as a day or evening invitation, Save the Date, RSVP, Place Name tag, Order of Service, Thank You card and much, much more, this beautifully versatile wedding suite is the perfect accompaniment to any seaside wedding! Tags: Beach, Nautical, Ocean, Seaside, Watercolour, Waves.